The technology associated with wireless transmission systems constantly changes and evolves. Staying up-to-date with all the products and services can be a daunting task--even for those in the industry. That's why Aviat Networks, Inc. created their first wiki through EditMe two years ago that allowed employees located around the world to collaborate. The first wiki focused on only one product, but it was so successful that the company decided to add more wiki sites that would encourage discussion about other products. Aviat Networks wanted their employees to be able to enter all the product wiki sites using one login and password on one centralized page. And, as the network would become widely used throughout the company, they needed to maintain their corporate design standards. That's where EditMe's customization crew came in. EditMe worked with Aviat Networks to create a "master" page that linked wikis for different Aviat products. All the wikis use the same database of user names and IDs. EditMe also adapted the company's existing corporate CSS template, giving the entire network a cohesive look and feel. Aviat's sales staff travel extensively and are often unable to connect to the company Intranet. Since EditMe's wiki sites are hosted on the World Wide Web, they can still access them from a standard Internet connection--at any time. And because the wikis are protected through a secure login, the content remains confidential-only allowing employees and chosen partners to view and edit the wikis. "Our sales staff needed to access and edit our wikis on a regular basis. They didn't like the complicated editing interfaces that came with other wiki software. The EditMe interface was easy for them to understand and use," says Emily Cotlier, Senior Technical Author at Aviat Networks. When Aviat Networks, Inc. decided to move from one wiki to a collection of interlinked wikis, they could not create this extensive network using an existing template--they needed a customized solution. Because Aviat had already experimented with one wiki site, they knew exactly what they wanted in the new network. In order to make that a reality, they needed a provider that would take the time to understand their needs and develop a creative solution. They found exactly what they needed with the EditMe customization staff. "EditMe was in constant communication throughout the customization process. We had an excellent experience!" says Cotlier. "Our sales staff didn't like the complicated editing interfaces that came with other wiki software. The EditMe interface was easy for them to understand and use. Plus, they can access the sites from anywhere, rather than just through our company's Intranet." - Emily Cotlier, Senior Technical Author at Aviat Networks, Inc. Create a network of wiki sites that connects employees located around the world and encourages collaboration about company products. 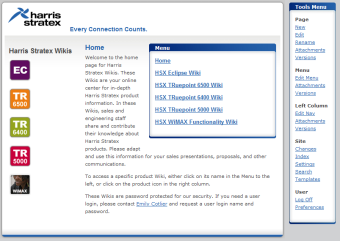 Allow employees and selected partners to enter the wiki network from one secure login area. Integrate the company's existing corporate design across the wiki network. EditMe created several wikis sites, one for each of the company's major products, that employees can view and edit directly from the World Wide Web. EditMe developed a single "master" wiki that the additional wiki sites use for authentication. EditMe adapted the company's existing corporate CSS template, giving the entire wiki network a cohesive look and feel.